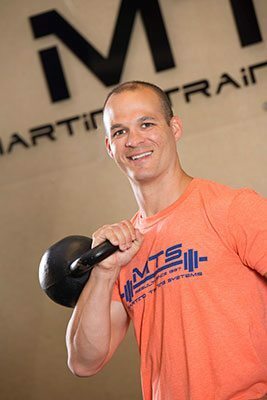 Andy Schaefer is trainer and co-owner of Martino Training Systems. As a Certified Fitness Trainer through the International Sports Sciences Association (ISSA), Andy’s philosophy when training clients is to Move, Feel and Look better! Born and raised in Iowa, Andy has been active and involved in fitness most of his life. Playing a variety of sports, he began weight training at an early age and was hooked immediately. He attended Waldorf College in Forest City, Iowa. While completing his Associate Arts Degree, he also played football at the collegiate level. After graduating from Waldorf College, he moved to Springfield to finish his education at Missouri State University. After graduating with a Bachelor of Science Degree in Criminology, Andy moved to Plano, Texas to begin a career in law enforcement. During his time as a police officer, he realized his true passion and left the Plano Police Department to pursue a career in health and wellness. Andy went back to school and completed his Master of Science Degree in Health Promotion and Wellness Management in 2010. Prior to joining Martino Training Systems in 2013, Andy had three years of very valuable experience as an Account Executive and health educator with Mercy Corporate Health & Wellness. The experience working with company leaders and their employees, taught Andy how important a healthy lifestyle is not just in your everyday life but also at the workplace. Throughout his personal and professional life, Andy’s passions have always been health, nutrition and fitness from which have evolved since being a college athlete, police officer and now a fitness professional. He brings these passions and commitment to working with his clients to reach their individual goals. Andy’s goal is to make each client realize they can be fit, strong and successful while still enjoying life outside them gym! . Andy and his wife Lindsay have a two year old daughter Gabriella and are expecting their second little one in December of 2016. Are you ready to take the first step in becoming a healthier person? We start with an evaluation that includes a functional movement screen, body fat percentage, measurements and weight. We then use this as a baseline to create a customized fitness program that will show results!